Dreams of a Moonlight Garden - Jill Ruth & Co.
As you plan your garden for this year, you might consider white. When we first moved into our house one of my flower beds was deemed the "Moonlight Garden" and I had hopes and dreams of white flowers glowing at dusk and illuminated by the moon. Well, 15 years later, I still have the dream. 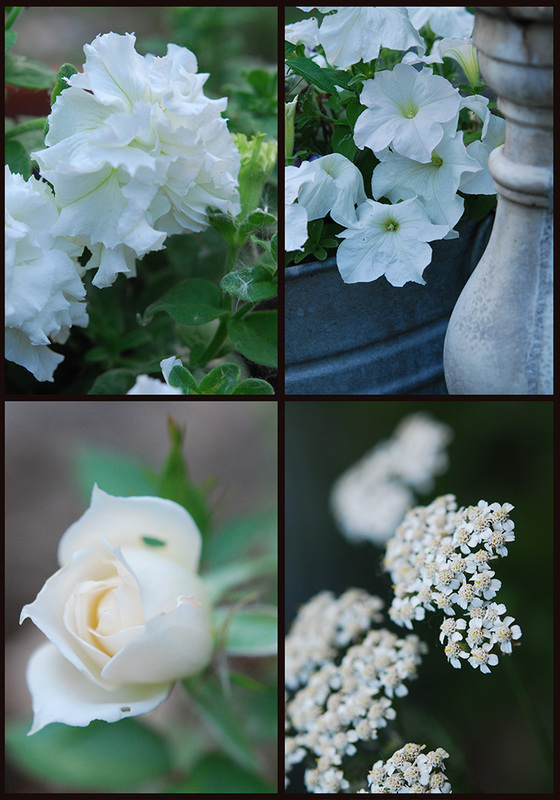 :) The soil was poor, my attention to the bed has had a wee bit of competition, but I still plant white flowers in pots and enjoy those at dusk. I took the photos in the two mosaics at dusk one night last summer. They are straight out of the camera with no editing, I think you can tell how they just pop at dusk and if you have bright moonlight, by the moon. I have also found that light purple plants are gorgeous at dusk. I remember the bloom of the milkweed plant and Husker Red Penstemon being amazing as the sun went down. I would really like to hear your experiences with moonlight gardening! I love all white gardens. Most of what I plant...and manages to live...is shades of white. I've been intrigued by the idea of a moonlight garden, but have never planted one. Maybe this will be the year. Can you share what plants you prefer in yours? what a sweet idea .... white and green are so restful .... your photos have me wishing for spring! uhmmm... i have some white silk flowers. I'm going to go put them outside when it quits raining. ADORE your photos... they are each and every one of them gorgeous!!! I use white in my shade gardens - white bleeding hearts, white striped hostas, and lily of the valley really show well in the shade. I am totally charmed by your vision of a white garden Jill! I had an all white garden for a long time then when we repainted the house I planted more bold colors. I've now started slowly changing back. The problem for me is that there are such great plants that don't come in white. One of these days I will have a backyard and not just trees and woods. The cobblers children have no shoes kinda thing.